The sea and the beach are elements that have been woven throughout Anne Morrow Lindbergh’s life. She spent her childhood summers with her family on a Maine island. After her marriage to Charles Lindbergh in 1929, she accompanied him on his survey flights around the North Atlantic to launch the first transoceanic airlines. The Lindberghs eventually established a permanent home on the Connecticut coast, where they lived quietly, wrote books and raised their family. several years they lived on the island of Maui in Hawaii, where Charles Lindbergh died in 1974. Reeve Lindbergh is the author of many books for both adults and children, including the memoirs Under a Wing and No More Words. Anne Morrow Lindbergh was born in 1906. She married Charles Lindbergh in 1929 and became a noted aviator in her own right, eventually publishing several books on the subject and receiving several aviation awards. 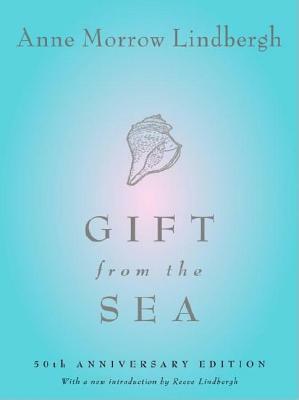 Gift from the Sea, published in 1955, earned her international acclaim. She was inducted into the National Aviation Hall of Fame, the National Women’s Hall of Fame, and the Aviation Hall of Fame of New Jersey. Mrs. Lindbergh died in 2001 at the age of ninety-four.